Presenting a Mothers day giveaway for all my lovely followers. 1) Visit www.jabong.com and comment below a product link which you would like to gift your Mother this Mother's Day. 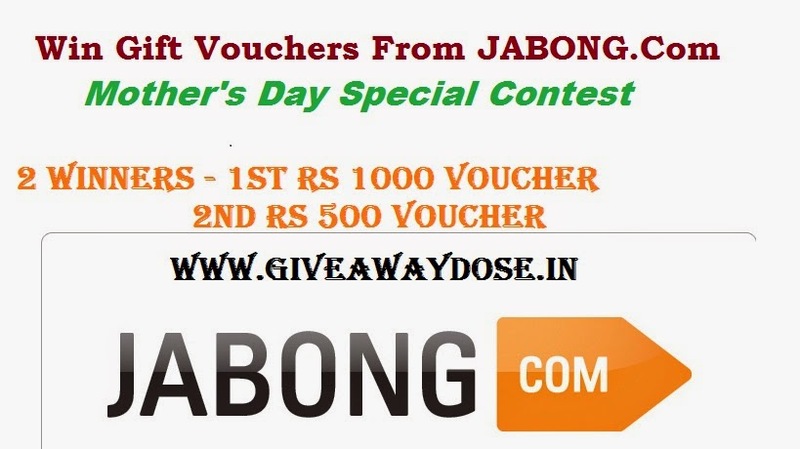 2) Share this contest link ( http://www.giveawaydose.in/2015/05/mothers-day-giveaway-with-jabong.html ) in FACEBOOK or TWITTER and TAG your friends to let them know about this contest. Very easy steps to win. Contest Ends on 13th May ,i.e, in a week. A mother's day giveaway is the best reason to celebrate. Thanks for that Prerana. Happy Mother's Day to all lovely mothers. I would like to gift my sweet mom this beautiful and simple suit . I would like to gift this beautiful saree to my mom as she likes blue colour and sarees with thick border. Would look great on her , stylish and classy . I would like to gift a saree for my MOM because as always saree makes her looks stylish & classy!! My mom love wearing sarees and her fav color is blue..If i get a chance to win a voucher i can add some more money and buy her this beautiful saree. My mother is the most precious asset of my life. Right from the very beginning, my maa has always been a "cool mom". She believes in "Live life king size". She has always been an optimistic person & has created a healthy & positive environment at home. She has always taught me to look forward in life with courage and never give up. I love her dialogue " Either do the things you love or start loving the things you do". Her positive attitude has always helped me in life for which I will be forever thankful to her. Also following you on Google Plus with my name heer jalundhwala. I would be the happiest one on this planet if I win this giveaway. Please Notice my efforts. I would lobe to gift my mom this beautiful blue embroidered saree http://www.jabong.com/vishal-Blue-Embroidered-Saree-1377476.html?pos=1 since she is a saree lover and this saree would definitely make her look more elegant and would be just the perfect gift for her which she could carry off well in her kitty parties or even family functions!! My mom loves sarees. Though she has so many sarees in her cupboard, she always keeps asking me to buy some new sarees for her. She is so crazy about these sarees. So, I would love to gift Ishin Blue Embroidered Saree. It’s such a gorgeous saree and I’m sure she’ll shower me with kisses, if I gift it to her. Completed all the steps ! I will try my best to win this giveaway and share it maximum times as I really wish to win it for my mummy. I have followed all the rules & I would be delighted if I win this for my jewel. Red And Black Affair ! Gorgeous Pink Prom Dresses ! Looks Of Sonam kapoor I loved from Cannes. Best Replacement System For Hair Loss ! Life Is A Big Deal ! Own Your Dream hairs ! Me Baby & Zenfone !